I need to get my act together! Everytime I start off on the path of clean and sober bloggin' I hit a snag or a bump in the road that facilitates my prompt departure from the wagon. Awww dammit! So what do I do? I saddle up and head to HOW to get my creative but kicked for 4 days and pick up gems from some of the brightest and best, many of whom are Pals of RDQLUS. Justin Ahrens ("JA RULE-29" as I like to call him), was just one of those pals of RDQLUS that laid down some serious mind sauce, appropriately on the swan-song day of the HOW Conference. Punch the link and go get schooled in the ways of staying sober as a creative and keeping the goodness going. 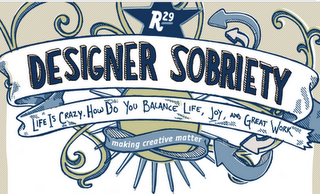 Justin Ahrens (of Rule29) presents "Designer Sobriety"